This rare and interesting name, strongly associated with the County Palatine of Lancashire, is probably of Norman-French origins. It would seem to derive from the word 'haubergeon', and as such is job descriptive and possibly locational for a maker of (or a place) which manufactured 'haubergeons', or chain mail sleeveless armour worn over a leather jerkin. We believe that this meaning applied by usage to the village in Lancashire now known as Habergham Eaves, but in 1242 recorded as 'Habrigham' and claimed by the English Name dictionary, as deriving from the old English 'heahborg', a 'high (heah) hill (borg)'. Our research indicates that 'haubergeon' was probably introduced into England at the Norman Conquest of 1066, and that the village in Lancashire became famous for the manufacture of the chain mail, and in consequence changed its name. 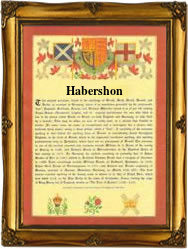 The surname in its various and colourful spellings retains much of the original French in the spellings as Habershon, Habbershon, Habberjam, Habbijam, and Habergham, but is wholly anglicized in the spelling as Habgood. Interestingly the name Habershaw refers to a makers of 'bill hooks' and 'halberds'. The early church recordings include Issabelle Haberghame, who married William Lorde at Burnley, Lancashire, on October 29th 1577, Gilberto Haberiambe, christened at St Peters Church, Sheffield, Yorkshire, on April 4th 1585, and Matthew Habershon, (1789 - 1852) who was the architect of the Anglican Cathedral in Jerusalem. The first recorded spelling of the family name is shown to be that of Matthew de Habercham, which was dated 1269, in the rolls of the Lancashire Inquisitions, during the reign of King Henry 111, known as 'The Frenchman', 1216-1272. Surnames became necessary when governments introduced personal taxation. In England this was known as Poll Tax. Throughout the centuries, surnames in every country have continued to "develop" often leading to astonishing variants of the original spelling.